LG has shown that it is still in the game, with the announcement of the LG V40. Just last year, the company introduced the V30, a slick device with a glass black. The device came with very slim bezels and a pOLED screen that was manufactured by LG itself. Before the V30, LG released the V10 and the V20 with metal designs. With the success that the V30 got, a lot of people have been anticipating the launch of the V40. It is expected that this device will be very much like the V35 which was announced earlier this year as a follow up to the V30. The good news is that LG has finally announced a launch date for the V40, and it is in the first week of October. 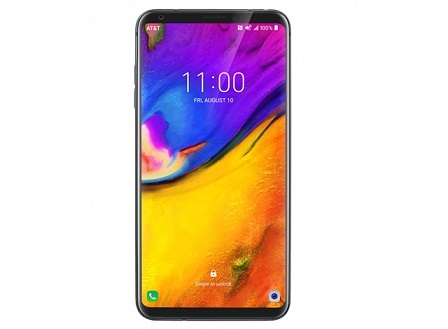 Already, there have been a number of leaks and rumors concerning the LG V40 ThinQ. Now, we are about to see if the rumors actually hold any water. 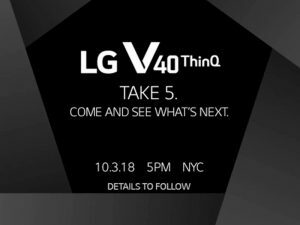 LG has sent press invites to an October 3 event in New York City, USA, where the company will finally launch the V40 ThinQ. On the invite, LG confirmed both the name of the phone and the logo. The company also included a tagline that read “Take 5”. This suggests that the device may likely come with five cameras – good news for lovers of mobile photography. It is not yet confirmed what the configurations of the five cameras will be. However, it is generally expected that there will be three shooters at the rear of the phone while the remaining two will sit on the front. As with many other phones from LG, it is expected that this phone will come with an amazing camera quality. The LG V40 ThinQ will likely be powered by Qualcomm’s Snapdragon 845 chipset. This has been the processor of choice for most of the flagships of 2018. This chipset would ensure that the V40 enjoys amazing performance, camera processing, and battery life. Users can now simply wait for a confirmation of specs on October 3.